A 120V AC Wire-In Alarm with Battery Backup provides worry-free protection for you and your family. The Kidde Smoke Alarm can be interconnected with up to 24 alarms (we recommend using connecting alarms made by the same manufacturer) throughout your home. All sound simultaneously if one is activated, providing you with full reporting for maximum safety. 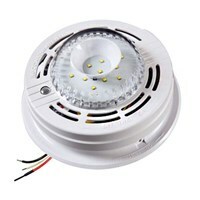 LED lights let you know the Kidde Smoke alarm is working, or press Test for periodic checks of battery and alarm operation. Non-emergency or nuisance alarms can be silenced with the Hush button. 85-decibel alarm sounds loudly, alerting the household to a fire. 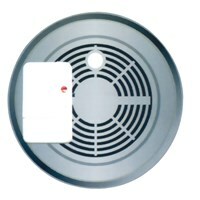 For Deaf or severely hard-of-hearing individuals, look for our Strobe Light attachment for the Kidde Smoke Alarm, (sold separately) which easily connects and provides the important visual cue needed. Kidde Smoke Alarm uses Ionization Technology which senses invisible particles produced by most flaming fires. Use this alarm in addition to your regular photoelectric smoke alarm, which is more responsive to visible particles produced by smoldering fires, for complete coverage against any type of fire. UL listed. Includes bilingual (English/Spanish) instructions, 9-V battery and a 5-year limited warranty.